This range of distributed wireless firing systems are composed of many 1 cue (channel) receivers and a central remote control. This sort of system is ideal if you need a wireless firing system to remotely ignite fireworks that are spread out. It is also ideal for indoor fireworks, stage pyrotechnics, wireless firing of buttlet hits on actors and other theatrical pyrotechnics. This firing system also finds use on airsoft and paintball ranges to fire airsoft pyro, paintball pyro, smoke grenades and electric thunderflash devices. All firing systems on this page operate with one another. 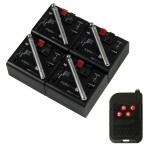 You can pair as many receivers to as many remoe control buttons as you want. If you need advice, we are happy to help! 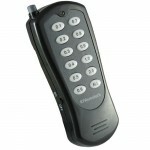 1 Button Remote Control Transmitter for the 1..